It ended up being a super fun trip. I went with my friend Phaedra who was kind enough to drive the whole way! I’m so excited to have friends that are up for trips and the like. It has been a long time since that happened. We drove down Friday because we were both able to get work off but didn’t get to the hotel until 7 pm. Then we met up with my friend Larry who I have met over youtube and we had such a good time. Larry and I also stayed up late filming videos for our youtube channels which was fun. We filmed 7 in total which you will see on both channels over the next 6 months or so (I will have some editing to do). It was a lot of work but fun as well and I can’t wait to hear what people think about the various videos. The next morning we slept in and got room service (my favorite thing ever!) and then got ready for the musical matinee. 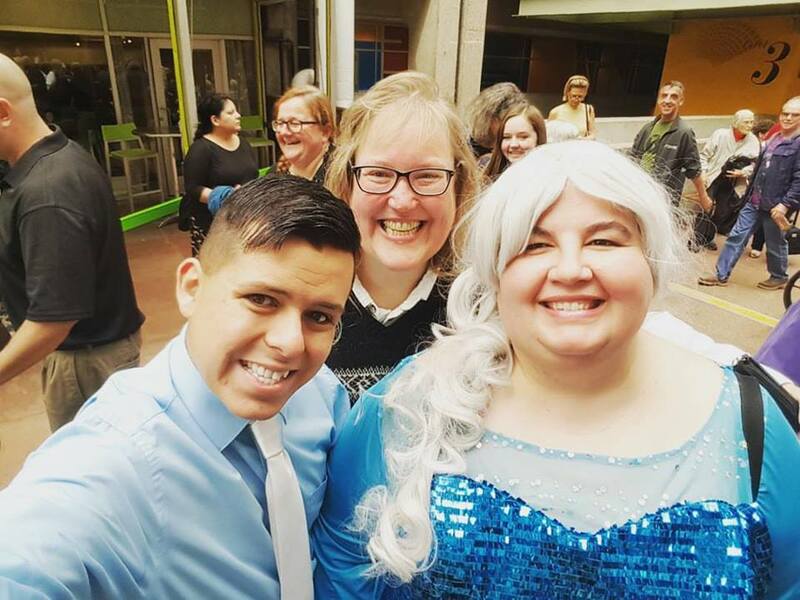 I wore my Elsa cosplay and I wondered if it would feel weird but I am so glad I did. Then we went to see the show and unfortunately our seats weren’t very good but it was still an amazing musical. It is similar to the movie but with a few new songs and small changes that added to the story (unlike other Disney adaptations that the new songs were forgettable and bland). The artistry and spectacle of the show was really special and the talent amazing. You can read my review here. 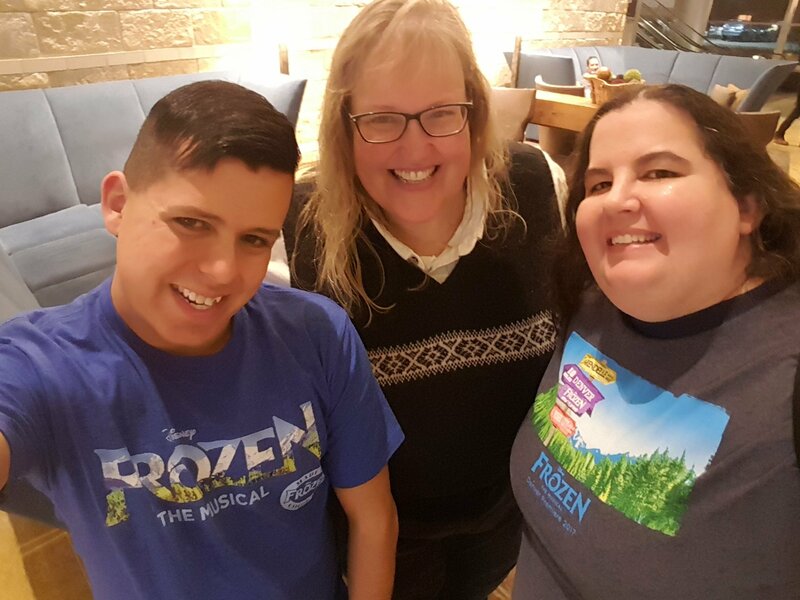 The three of us had so much fun together and I hope we make many more trips to Denver. This is one of my favorite recent pictures. We all look so happy because we were! We ended the day filming our review, eating pizza and talking and it was a great time. Sometimes I think these little 2-4 day trips are the best and most relaxing. The prep and recovery time isn’t bad and they are very relaxing (of course the most for me because I didn’t have to drive! Thanks Phaedra). 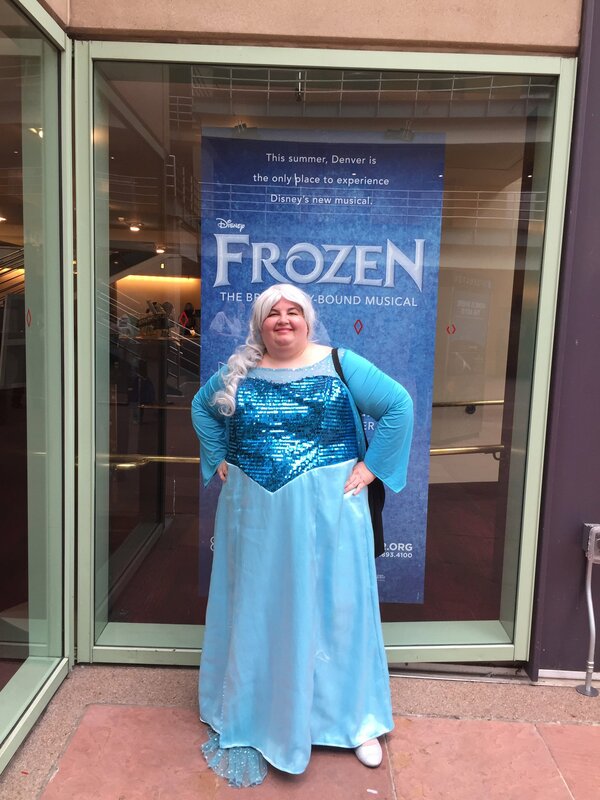 I hope you all get a chance to see Frozen: the Musical. It is a lot of fun and I hope you get a little break from your day to day lives to relax and recuperate. I know I sure needed it!